Elder Brenda left Jericho and joined Michael Freeman’s church the Spirit of Faith. She was over there for a little more than four months. Elder Brenda asked Michael Freeman if she could be placed on his Elder team. Michael Freeman told her NO. He said she will have to start as a Deacon. Elder Brenda came back to Jericho and continued with her duties as an Elder at Jericho. In secret you LEAVE Jericho and JOIN another church ‘Spirit of Faith’ under Michael Freeman …seeking to be placed on their ministry team… you get REJECTED…then return to Jericho as if you never left, and you did not REJOIN the ministry… you just stepped back into your previous position as if you are entitled to be an ELDER. How is that possible? Is it in the manual? Here is the icing on the cake. I am sorry… I will pray for this woman because God command us to do so, BUT I WILL NEVER ADDRESS HER AS ELDER again! These folks have truly proven to be a piece of work! We continue to seek and hear from God concerning these matters and ordination is coming up! You know this is so crazy…We are really need to stay on our face in prayer about this matter because some of the things our leaders are doing towards Pastor Joel and the Congregation is disrespectful. I didn’t realize you can leave a church and come back and still be an Elder. I could be wrong be is that possible..My family is praying now for peace and for Gods will to be done in The City Of Praise. I pray that God will continue to strengthen our first family.. 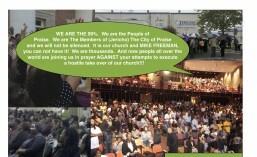 I promised you when we come out of this…God will be glorified!! Well looking at the Scriptures, I do remember a man who was with the Righteous and left to go and chill with thoses who was opposing (to set against; place opposite, to contend with in speech or action, etc.) Him; then went back to the Righteous and gave Him a kiss. That man name was Judas. And the Righteous (JESUS). There is NOTHING NEW UNDER THE SUN. The attack is not only against PASTOR JOEL. It is against THE BODY OF CHRIST AS A WHOLE. IF WE LET THE ENEMY HAVE HIS WAY IN THE CHURCH THERE WILL BE SO MANY THE DEVIL WILL TAKE WITH him to the Lake of Fire. RISE UP SAINTS OF THE MOST HIGH GOD AND LET USE THE WEAPONS/KEYS THE LORD JESUS CHRIST HAS GIVEN US. WE HAVE LEARNED THE LORD GOD’S WORD FROM THE BEST (THE PEEBLES). LET THAT MUSTARD SEED FAITH GROW WITH FASTING AND PRAYING FOR PASTOR JOEL AND HIS FAMILY AS WELL AS COVERING EACH OTHER, THE CHURCH UNTIL WE SEE THE MANIFESTATION IN THIS EARTH REALM. PRAY WITHOUT CEASING – SPEAKING AND STANDING ON THE WORD OF THE MOST HIGH GOD IN CHRIST JESUS OUR LORD. KEEP YOUR MIND STAYED ON THE LORD BUT PLEASE EXPOSE THE ENEMIES, WE NEED TO KNOW THE TRUTH.